Induction Heating and Melting Capacitors are available in Bulk and Vernier designs, live and isolated case, depending upon the design frequency. 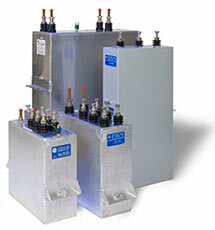 Capacitors are designed with and without brackets, and with and without pressure switches which are utilized by equipment manufactures to shutdown equipment in the event that pressure builds up inside the metallized design capacitor can (see capacitor instruction GEH-2733). For water cooled capacitors, proper water flow and water outlet temperature must be maintained as specified in GEH – 2733. Failure to provide adequate water flow will cause early failure of capacitors. The equipment manufacturer must determine what fusing is necessary to protect capacitors in their equipment. Protection must be provided by the equipment manufacturer to protect from re-closure or re-energization of a failed or shorted capacitor.